Exploring in a galaxy far, far away is the CyberKnights, from King’s High School in Seattle. We are a group of students on a robotics team that work cohesively together to build a unique competitive robot. The organization that we are part of is called FIRST® Robotics -- For Inspiration and Recognition of Science and Technology. They provide opportunities for teams like us to build our dreams into reality. During this build season, we developed robots according to this year’s game specifications and theme: Destination: Deep Space, presented by the Boeing Company. The Pacific Northwest District Championship consists of teams from Washington, Oregon, and Alaska. Out of 155 teams, only 64 teams qualified to compete at the District Championship. We placed 2nd as one of the highest scoring bots in our district. Robotics competitions run similarly to basketball tournaments: each team plays against each other, and whoever wins that set of matches proceeds. The statistics from our qualification match performance are pretty impressive with a record of 10-2. We would like to thank Aumsville High School, McMinnville High School, and Newport High School for competing with us in our final rounds. Finally, after all of these statistics and facts comes the best part: we qualified to go to the Houston FIRST World Championships for the 11th consecutive year! FIRST is More Than Robots. FIRST participation is proven to encourage students to pursue education and careers in STEM-related fields, inspire them to become leaders and innovators and enhance their 21st-century work-life skills. The CyberKnights seek to inspire interest and passion for science and technology while preparing students to become industry leaders in tomorrow’s competitive global marketplace. 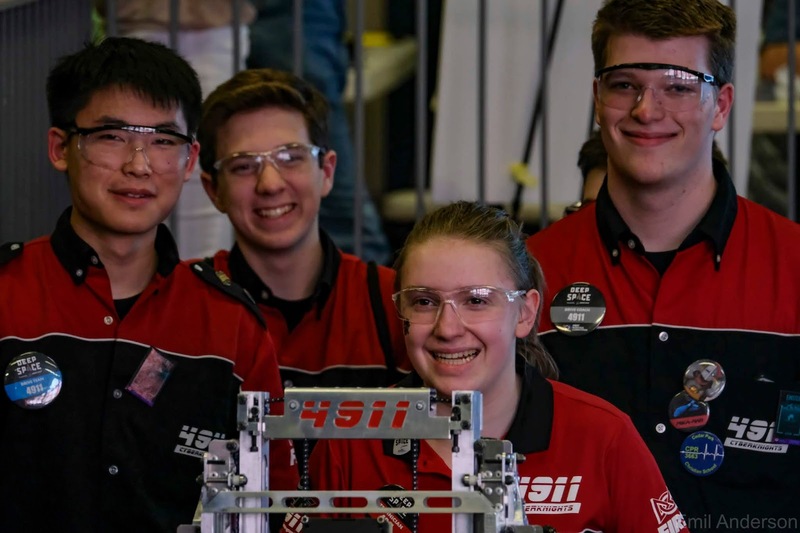 The King’s High School’s award-winning robotics program serves as an educational community within King’s Schools as well as FIRST Robotics. The CyberKnights serve as the founding team of King’s Robotics, a group of FIRST Robotics Competition, FIRST Tech Challenge, FIRST Lego League, and FIRST Lego League Jr. teams. In its endeavor to successfully embody FIRST values and goals, the CyberKnights seek to create a team culture that sustains their community for years to come. From team recruitment, developing student leaders, maintaining a gender-equal team, serving as FIRST ambassadors in outreach, collaborating with each other in a student-led environment and asking corporations to support them as the next generation of leaders, the CyberKnights strive to be an organization of people impacting the world for FIRST. Starting in 2009 in FIRST Tech Challenge with eight students, the CyberKnights have inspired over 10% of King’s Schools K-12 students to participate in FIRST programs. CyberKnights Alumni have gone on to pursue fields in STEM (science, technology, engineering, and mathematics), and return to invest in the program as mentors for the current team. The team continues to develop its members in leadership, collaboration, and communication skills.